Simon’s Mini ist wieder bereit! Der während der Überführung Gijon – Sada (ESP) verloren gegangene Windmesser ist wieder geflickt und das Boot ist wieder voll beladen mit 120l Wasser und ca. 30kg Essen für die Atlantiküberquerung. Heute um 17.30 Uhr soll es nun wirklich endlich los gehen! Von Sada (ESP) mit einem Waypoint vor Lanzarote (aber ohne Stop) geht es direkt nach Pointe-à Pitre in Guadeloupe. Le mini de Simon est de nouveau prêt! Pendant le convoyage Simon a perdu ses instruments au top du mât. Il a pu réparer ça en utilisant son matériel de réserve. Le bateau est donc prêt et chargé avec 120l de l’eau et env. 30kg de nourriture pour cet étape. Aujourd’hui à 17.30 le départ sera finalement donné! Les Ministes vont partir de Sada (ESP) avec un waypoint devant Lanzarote (mais sans s’arrêter) directement à Pointe-à-Pitre en Guadeloupe. Simon’s Mini is ready again! During the delivery from Gijon to Sada (ESP) Simon lost his wind instruments. 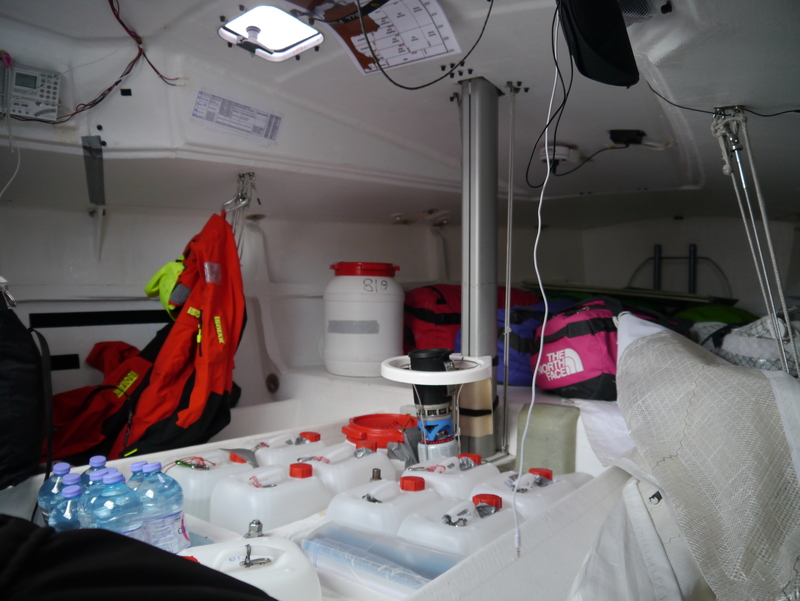 Everything is now fixed again and the boat is loaded with 120l of water and about 30kg of food. Today at 5.30pm the start will finally be given. The Mini-Sailors will sail directly from Sada (ESP) to Guadeloupe with a waypoint (but no stop) in front of Lanzarote. The Minitransat 2013 will be the longest in its history with 3700miles to be sailed. This entry was posted on November 12, 2013 by simonkoster. It was filed under Uncategorized .